I just wondered if anyone else made a similar journey into comics—coming to them from a different medium. and Aquaman (and the Three Stooges!). the show from the show from the 60s. My first experience with comics was the 60's Batman TV show, well reruns of the show in the mid to late 70's also the Superfriends cartoon. I probably picked up my first comics around that time. vaguely remember really liking Iceman at the time. I discovered Superman through the Christopher Reeve movies. sold on the whole business. My first comic was Donald Duck (it was also the first thing I read myself), from which I moved onto things like Transformers and G.I. Joe. I also read some Spider-Man comics one of my older cousins owned, but I think I got my first own superhero comic was also the issue that introduced me to Byrne: the Finnish printing of the beginning of the Supergirl story. That year I also got some comics from my grandpa as a birthday present, including a Spider-Man issue with the end of Kraven's Last Hunt which creeped me out enough to put me off Spider-Man for a few years. I got into the X-Men (and Alpha Flight) thanks to school - my class' reading box had the Finnish printing of X-Men/Alpha Flight: The Gift which resulted me in picking up the regular X-Men title and asking for a subscription as a birthday present. It was also at this point when I returned to Spider-Man and found the Fantastic Four (Walter Simonson's big Doom story). Later that year I got into Daredevil, Ghost Rider and Hulk too. I had that Marvel Family Viewmaster deal. That was soooo cool. Mine was a mixture of the Spider-Man cartoon (60's version which was shown every summer holiday here in the UK), The Chris Reeve Superman movie (the first film I ever saw at the cinema) and The Incredible Hulk tv show. This also gave me my first lesson in comic to film adaptation: When I asked my Grandad why he was Bruce in the comic but David on TV he said "They always change things from the books. That's why books are better". Smart man my Grandad. A friend gave me some Hulk issues, the first one i read was Hulk #272 - Sasquatch vs Hulk vs Wendigo. The issue was in one of those brazillian magazines that translated into Portuguese, came in a smaller format but had like 100 pages and 4 stories\comics in it. So it also had Avengers 12X and Fantatic Four 150, which features the wedding of Quicksilver and Crystalis, and Ultron's assault at the Inhumans, Fantastic Four and Avengers. ... sadly enough, the exact same characteristics that drew me into comics, are now all dead and unused. Difficult to say in some sense but I think I definitely was exposed to the characters through other media first. There was a bit of an explosion of comics-related media on TV: Lynda Carter's Wonder Woman, the Spider-Man live action series on ABC, Batman and Adv of Superman reruns on local independents, the 60s Spider-Man cartoon, and the Incredible Hulk tv show. And Superfriends. Outside of their TV representations be in in cartoon or live-action forms, I didn't 'get to know' any DC characters until Byrne penciled the post-Crisis mini-series Legends which seemed like a good jumping on part. I'd heard about the Crisis mini-series and picked up the Death of Supergirl issue but I could make no head-nor-tail of multiple Earths, Anti-Monitor and all that. I was maybe 12 at the time. My first DC comic was a Plasticman issue that was a gift when I was down with a bad flu. That would've been around Nov '82. I'd been familiar with Marvel's universe and tentpole characters for years, probably *before* other media exposures. DC's comics just looked very stuffy. I tried Crisis. The 'hot' Robin mini-series, even the IMPACT! imprint when it started but there was something about the DC characters and safe art style that didn't grab me. I left DC when Byrne quit Superman, never really "finding" the characters even though I knew them from other exposure and *wanted* to like their comics. I just couldn't find good jumping-on points. Especially with Batman, I was very disappointed with how dark the books seemed. I guess most of you know by now that my "journey into comics" began with the George Reeves Superman series being shown on the BBC in England when I was about 6 years old. Not long after I started watching that series I saw one of the hardcover, black and white "Annuals" that were being published over there at the time, and soon after foung a copy of an Australian reprint called "Super Comics" that featured a story each of Superboy, Johnny Quick and Batman. The Batman story hooked me for life. A couple of years later my family emigrated to Canada (for the second time, no less!) and I discovered the vast array of American comics available at the time. creeped out by him, because, well, spiders. Batman comic because there was a man with a gun on the cover. I think I first met Captain Marvel and the Marvel Family through my Viewmaster. I didn't remember this until you just mentioned it, but that was my first exposure to Captain Marvel, too! Wow, what a nostalgia trip. I was born in 1972, and like many of you grew up watching "Superfriends" and the like before I ever got into comics. I do recall getting a couple of 3/bag comics one Christmas, Marvel & Whitman stuff. In 1982, my older brothers were into comics a few months before I was, so I was familiar with them, but not ga-ga. 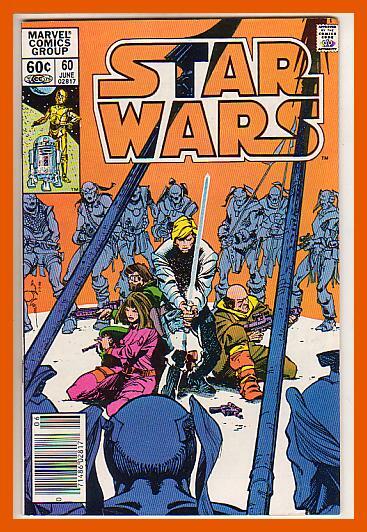 The first comic that I bought with my own money was 'Star Wars' #60, because I was curious about comics and curious how this fit in with one of my favorite movies. I quickly branched out into Captain America, Iron Man, and, yes, Captain Carrot. That Joe Kubert Hawkman cover really stands out in that group, doesn't it? There are really good artists, and there are really good comicbook artists, and often they are not the same thing. Jack Kirby, for instance, was a moderately good artist, but he was one of the best comicbook artists of all time. Curt Swan, on the other hand, was a truly superb artist, but in some odd fashion that stood in the way of him being a truly great comicbook artist. Kubert, however, was and is an extraordinary fushion of both. A superb artist, and one of the best comicbook artists ever to work in the field. The 1960s Spider-Man cartoon, Spider-Man and his Amazing Friends and Super Friends were probably my first exposure to comic book characters. ever to work in the field. sweeping up Will Eisner's eraser shavings. There are really good artists, and there are really good comicbook artists, and often they are not the same thing. Where do you think Alex Ross lies on that spectrum ? Years later I actually bought a comic. I love Kubert, and it's a nice cover, but I don't think it's head and shoulders over the rest of them--there really isn't a bad one in the bunch, though the Batman is pretty standard stuff. In fact, if I were to pick a favorite, the nod would go to the Gil Kane Atom cover, which I think is one of the great covers of the silver age. Because I'm about the same age as JB, we share some of these firsts--i.e., the Flash, B&B JLA, Hawkman, and Metalmen. He beat me on Green Lantern, which I didn't find until his final tryout appearance with the Invisible Destroyer on the cover. The Kubert cover raises another point for me though, which is that I always thought that the mask without wings was the best--the most birdlike, Hawklike. I understand the wings as a decorative element, but I still prefer the character as Kubert originally (re)designed him. This book was really my introduction to Kubert, as I wasn't a fan of war material at the time--his rich blacks and versatile textures were a revelation to me. As quite a young kid I had seen and liked the Viking Prince, but had little awareness of artists at that point. Where do you think Alex Ross lies on that spectrum? Much the same position as Kirby. On a purely technical level Ross' work is fairly pedestrian (tho vastly better than anything I could do), but as The-Guy-Who-Paints-Superheroes, clearly he is far above most others in the field. busy. Without them he looks more like, well, a HAWK. I first encountered Superheroes via The Superman/Superboy cartoons (by Filmation I believe) in the early 70's and Batman and Robin believe it or not as guest stars in Scooby Doo. Batman and Robin believe it or not as guest stars in Scooby Doo. I always used to watch anything Scooby I could find.